Click on the questions below to show/hide the answers provided. What types of hardware keys are available? USB hardware keys are used for licensing. There are two types of license keys for FAD Tools: a PC key and a Network key. The PC key is designed to be used on a single computer, i.e. the license is stored on a PC key and must be plugged into the USB port for the computer to run FAD Tools. The Network key is designed to be used on an office network, i.e. all licenses for FAD Tools are stored on the Network key as long as the key is plugged into any computer on your office network, all licenses will be available to any computer that has FAD Tools installed. This is useful if you have multiple users at one time and do not want to pass PC keys from user to user. Payment is due in full in order to receive the hardware keys containing the requested licenses. FAD Tools is available via download from fadtools.com. There is a 30 day trial period with printing and saving reports disabled. The software will be fully functional with the use of the hardware keys. Under certain circumstances, the trial period can be extended in order to accommodate delays in payment. Please email support@fadtools.com to request an extension. There are no discounts available at this point in time. How do I renew my maintenance subscription? Your maintenance subscription and upgrade period starts the day you purchase the software and extends through the end of the current year. As you near the end of this period, the software will remind you to renew support and upgrades for another year. You are not required to do this and the software will function normally after your period expires, but you will not receive updates or maintenance subscription until you renew. Invoices for renewing maintenance subscription will be mailed automatically and will be effective once paid in full. Regardless of when you renew your maintenance subscription and upgrade period, this period will always start and end on January 1st of the next year. For example, if you purchased the software on March 15, 2014, then your initial maintenance subscription and upgrade period would last through December 31, 2014. Once you pay the renewal invoice the support period would be extended until December 31, 2015. In the event you did not renew until more than one year after expiration (say April 1, 2016 in our example), then the cost to renew will increase proportionally and the renewal date will be set to the next year (in our example the renewal date would be January 1, 2016 and the cost would be double). This policy accounts for all of the work spent improving the software since the last renewal. Therefore, there is no possible advantage to delaying renewal. There is only the disadvantage of not having access to maintenance subscription during the period where the software was not renewed. How do I obtain updates? Upgrades may be downloaded directly from within the software using the Help/Check for Updates command built into the software. Is FAD 4.0 still available? FAD 4.0 is no longer supported by FAD Tools International and is not available for purchase. FAD 4.0 no longer meets ACI code for reinforcement design and does not contain the most up-to-date algorithms for foundation design. We recommend using the current version, FAD 5.1.18. What does it cost to replace a broken, lost or stolen key? The USB license key is a critical asset for using FAD Tools, without the license key the software does not work. It is possible for the USB key to malfunction, to become damaged, or to be lost or stolen. Malfunctioning key (dead key): Replacement is at no cost within the current support period. Damaged key: Damaged keys are replaced within the current support period for $150 per key. The damaged key(s) are returned upon receiving the new key(s). Lost key: A lost key is considered a lost asset. The key is the license, and the lost asset is replaced at the cost of the license. For lost or stolen keys, we will disable your previous key so it cannot be used. Once we receive payment the new key will be mailed out to you. If you were to find the previous key we can reactivate it but you will have to return the new key for a credit or pay the difference in software cost to keep it. What does maintenance subscription include? Maintenance subscription includes assistance installing the software and making it run on your system. It also includes verifying that the software functions correctly and fixing it in the event that it does not. Advanced questions regarding the capabilities of the software are included. What does maintenance subscription not include? Maintenance subscription does not include answering basic questions that are addressed in the manual, engineering design support, interpretation of design, or training in the use of the software. Training is recommended. See below for training information. How should I obtain maintenance subscription? Maintenance subscription questions should be addressed in email to support@fadtools.com. This allows for the question to be routed to the person most qualified to answer it. What version of Microsoft Windows does the software require? The software will run on the 32 bit and x64 editions of Windows XP, Vista, Windows 7, Windows 8, and Windows 10. Can the software be installed on a network? No, the software is designed to be installed on individual computers. Licensing can be controlled via a network file server and databases can be accessed via a network file server. Network licensing is available through the purchase of the Network License key. How do I switch license servers where the license key is located? Please use these instructions to connect your FAD Client to the License Key server. This assumes you have already installed FAD tools. If not, please do so and try and run the program. If you click back to the Sentinel Keys link, you’ll start to see the keys popping up. This may take a few minutes. Now, go ahead and reload the FAD Tools Program. You should be able to load the program now. If you can access this license server then you know the program is set up correctly. If you cannot, something is blocking port 1047 and you will need to have your IT department open up port 1947 so that the HASP license program can grab a license. Can I run more than one program from the same hardware key? Yes, we can combine licenses onto a single PC key. For example, if you purchased MFAD®, HFAD®, and TFAD®, we could give you one PC key that enables all three programs or three separate keys that each enable only one of the programs. When a Network key is requested, all licenses will be placed on the one Network key. Can I run the license over a VPN? There is a way to get FAD Tools network licenses to work over a VPN connection. We do not officially support this but a few clients have had success passing licenses through to a VPN client. Having problems installing your license key? Why doesn't my license key work on Windows 10? You need to update your HASP Sentinel Driver. Why am I getting zero days left on my trial? You need to update the HASP Sentinel Driver. FAD Tools 5.1 uses a database to store all program information. During installation, this database is installed in the FAD Tools folder on the local computer. The database can be moved to a network location to allow multiple users to access the same database. To access your FAD 5.0 database with FAD 5.1, make a copy of your FAD 5.0 database and change the file extension to *.fadt. When prompted by FAD 5.1 to update the database, click ”yes”. Once the database has been updated it will no longer be able to be opened by FAD 5.0. Following the steps below you can either create a new database or access an existing one. To switch databases once the program is open select “Options” and “Design Settings” and then “Browse”. The name and location of the database can be of your choosing. When you click “Open” it will ask if you want to create that database. Select yes. Or if there is an existing database you can search and select the database. The file path should appear under Database Location. Click “Ok” and the database should be ready to populate and the program ready to calculate. Why are there missing buttons within FAD Tools? FAD Tools 5.1 is known to have a resolution problem causing buttons to move or disappear within certain pop-up windows. 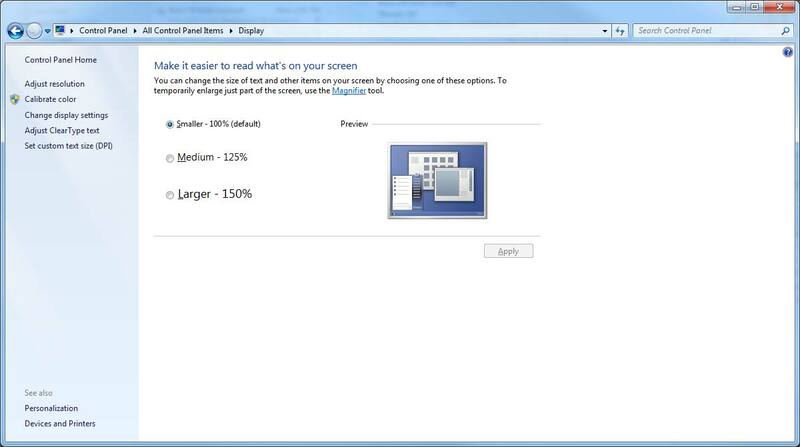 As a temporary solution, it is recommended to change your display font size to Smaller- 100% (default) under the Windows Control Panel > Display. We are working to correct this error within the upcoming release of FAD Tools. How do I resolve the “ContainerNotFound” error? Find where the network key is located, and get the IP address of this computer. Network key is a red dongle. Type http://localhost:1947/_int_/devices.html in the web browser where you installed FAD. The key should appear as shown in see Figure 1. Type “ping IP address where the network key is located” from cmd in the computer where you are installing FAD. If the computer is visible, then you see a reply as shown in Figure 2. Type http://localhost:1947/_int_/config_to.html in the computer where you are installing FAD and click on “Access to Remote License Managers”. Then type the IP address of the computer where the network key is located and check “Aggressive Search for Remote Licenses”. See Figure 3 for an example. If this doesn’t work, then check that Sentinel driver is installed in the computer where the network key is plugged into. One way to do this is to type http://localhost:1947/_int_/config_to.html in the computer with the network key. If you don’t see a webpage similar to Figure 3, then you need to install the driver in this computer as well. To do this, please, download the HASP Sentinel Driver installer from http://fadtools.com/html/downloads.html and install it in this computer with the network key is located. If none of the two previous steps work, even though you can see the computer where the network is connected using method 2, then contact us again because we need to reopen this ticket with Gemalto. If method 2 is not getting a reply from the computer where the network key is plugged into (e.g. Figure 2), then this is a problem in your network. The IT person should resolve this. We can provide ideas but no one knows the National Grid network better than an internal IT person. You can still try to do steps 1 and 2 of the previous steps and see if this helps. Is there a way to validate the database and results file? 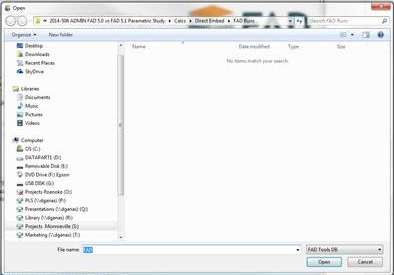 Database files (with file extension .fadt) store project information including all the user input values into FAD and the results of the most recent foundation analyses. The database file is updated during the operation of FAD based on the user input values and analyses. The database file, therefore, should be stored in a location that the user has read/write access and should only be accessed by one user at a time. The default database file is stored where the FAD program was installed. The user is encouraged to create new database files and can copy files to create backups. New database files can be created from the file menu in FAD Version 5.1.20 or under the options menu in FAD Version 5.1.18. Example Database files can be found under the Help menu within the FAD program or requested through maintenance subscription. Example results for these database files are also included. These examples are provided to verify that FAD is installed and functioning correctly. How does FAD 5.1 differ from previous versions of FAD? MFAD 5.1 includes updated algorithms to more accurately predict full-scale foundation load test results performed during the original development of the model. The end result of this re-calibration is a slightly softer deformation response than seen in earlier MFAD versions, where the same soils and load parameters result in an increased deflection on the order of 8% to 9% with the newer version (Kandaris 2011 presentation for EPRI). Do I need training to use this software? The software has been designed for ease of use. It is up to the engineer of record, however, to verify the model, the geotechnical properties, loads, and performance parameters are appropriate for the given design case. The User's Guide contains information on the assumptions and limitations of the FAD program. If you have any questions please contact support. If you are interested in further training, please contact us. Are there regular scheduled training classes offered? Training classes are designed for the specific needs of our clients. Please contact us for a training quote. Direct questions about the program can be answered through our support team. Please contact us at anytime by email at support@fadtools.com. We also offer a Users Group meeting periodically to cover aspects of the FAD program for all active subscribers to the maintenance program. Is there a factor of safety built into FAD Tools? The FAD 5.0 (and newer) software is based the calibration of full-scale foundation tests using a Reliability Based Design (RBD) methodology. As such, there is no “safety factor” per allowable stress design methodology as the program assumes the use of RBD. Please see section A.3 on Reliability Based Design in the FAD User’s Guide. MFAD 5.0 (and newer) have a built in resistance factor of 0.63 which is used to calculate the design shear and moment capacity at the groundline. Versions of FAD 5.0 (and newer) also report the Nominal (ultimate) design shear and moment capacity (i.e., prior to multiplication by the 0.63 resistance factor) which could be used to evaluate foundation designs with a factor of safety. However, we caution that FAD was created using the RBD methodology. We are aware that some users use MFAD, HFAD, and/or TFAD for the design of A-frame structure. The FAD program was not calibrated for A-frame structures, however, depending on the load combination and dimensions the results of a FAD analysis may be an appropriate model. Ultimately it is up to the user to verify the applicability of the software for their design conditions. Please see the User Guide for details on the different FAD modules. Note that only the MFAD program has been calibrated for load-performance equilibrium. HFAD and TFAD do not consider the performance (rotation or deflection) related to moment-uplift/compression interaction or torsion. Implicit in the HFAD and TFAD modules is the assumption that there is only minimal vertical displacement where bearing capacity is not a controlling factor in design. 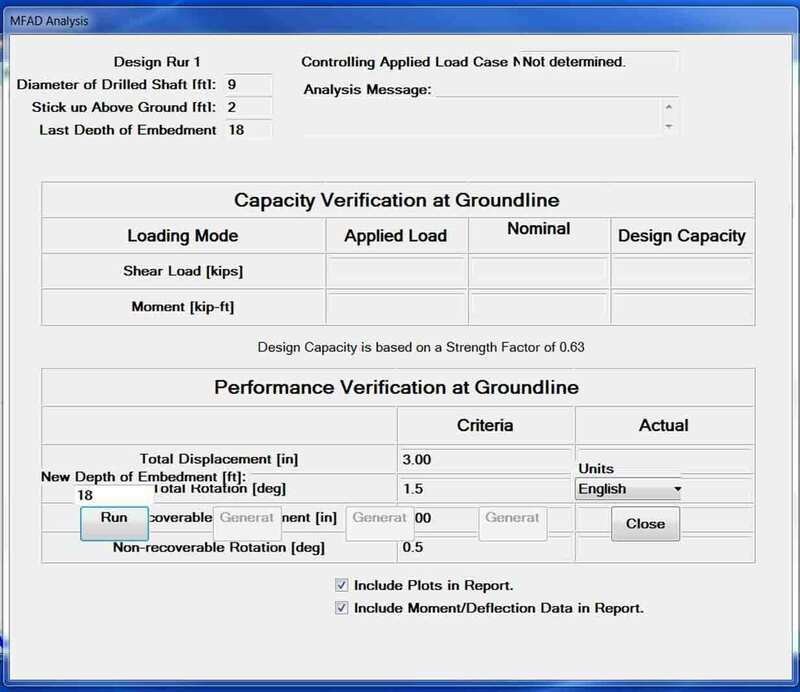 The user is encouraged to perform supplemental analyses outside of the program to verify bearing capacity when site specific conditions vary from program assumptions (e.g. negative skin friction, shrink-swell, and collapsible soils). What are the Ground Water and Unit Weight settings within FAD Tools? The ground water table is set in the geotechnical parameters data tab by the function “Depth To Water” (see figure below) and is used to internally calculate the effective unit weight when a layer is below the ground water table (see equations below). By default, the FAD program sets the “Depth To Water” to zero, assuming the groundwater table starts at the ground line and all layers below are saturated. The user should enter the design depth to saturated layer using the “Depth To Water”. The “Total Unit Weight” below this depth should saturated. Apply default values of 100 ft to model unsaturated soil profiles even though their soil profiles only extend to 30 ft.
Set the “Depth To Water” to a considerable depth and then enter effective unit weight values into the “Total Unit Weight” for both the subsurface and backfill (annulus) properties. The program will calculate. This calculation does not include the buoyant unit weight of concrete in the base moment and base shear springs. Use the moist (bulk) unit weight for soils above the “Depth To Water”, but these soils typically have low a degree of saturation and are based on field and laboratory testing. Note, below the “Depth To Water” the “Total Unit Weight” values must be greater than the unit weight of water for the program to calculate properly. Ultimately, it is up to the engineer of record to verify the geotechnical parameters used within the FAD program. Why are there duplicate projects within FAD Tools? Please be aware that a project may appear to be duplicated when you open up FAD. This display error can occur when there was a communication delay when pulling the project name and the project data from the database file. Do not delete the duplicate Project as this will delete all data. The program will function normally with the duplicate Project title. Meanwhile, reopening the program will remove the duplicate. We are working with our programmer to prevent this error. We recommend saving the database file (extension FADT) frequently. The current location of the database file can be found under the FILE tab, then selecting the OPEN. You can copy and move the database file within Windows explorer. What is the Factor of Safety within FAD Tools? MFAD 5.0 (and newer) has a built in resistance factor of 0.63 which is used to calculate the design shear and moment capacity at the groundline. Resistance factors for HFAD and TFAD can be found in the FAD Users Guide. Please see tables A.42 and A.43. Versions of FAD Tools 5.0 (and newer) also report the Nominal (ultimate) design shear and moment capacity (i.e., prior to multiplication by the resistance factor) which could be used to evaluate foundation designs with a factor of safety. We caution that FAD Tools was created using the RBD methodology and assumptions may not be appropriate for ASD design. What are the design loads used within FAD Tools? We are aware that customers use MFAD for design of foundations with larger loads. We would caution that the use of the strength factor and model calibration for reliability based design in MFAD may not be appropriate for all loading conditions. 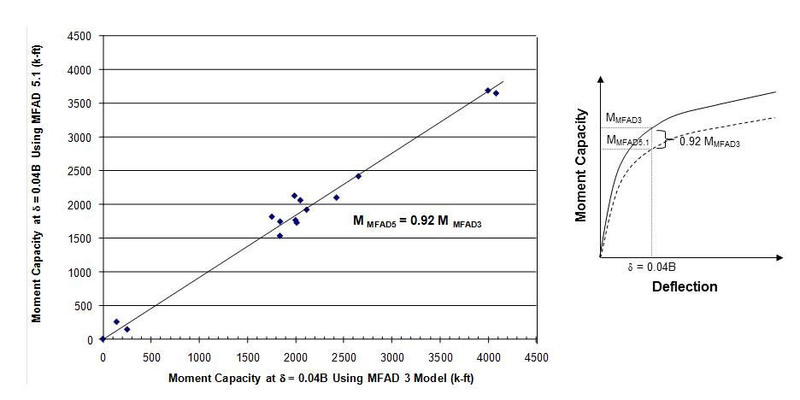 Ultimately, it is up to the engineer of record to determine that the applied loads are appropriate for the MFAD model. where EIf is the effective flexural stiffness the foundation (drilled shaft, direct embed), Es is the modulus of the subsurface (pressuremeter modulus) and D is the depth of embedment. See the updated user guide for additional information and references to the original full scale testing.